Despite building a tense atmosphere upon a solid premise, Dark Skies is far too unoriginal and vanilla to earn anything more than a casual dismissal. Horror movies come and go like people trapped in a revolving door, becoming more and more forgettable as audience expectations sink lower. But every once in a while, a beautiful stranger finds their way out of the loop, standing out amongst the rest of the drivel that fills theaters and breathing new life into the stale genre that gives fans just enough hope to keep returning for more. All it takes to keep us fans satisfied is an original idea, well-executed with a sincerity that comes through the film. Recent examples such as Insidious and Sinister captured this spirit, revitalizing the genre when it needed it most. Sadly, Dark Skies isn’t able to live up to the standards created by the aforementioned films, wasting its creative premise and well-developed suspense on predictable scares and an awful climax that hinted at better. The elements for a better than average horror film are here, but everything comes together in a way that feels forced, hoping to push out a finished product rather than a noteworthy one. 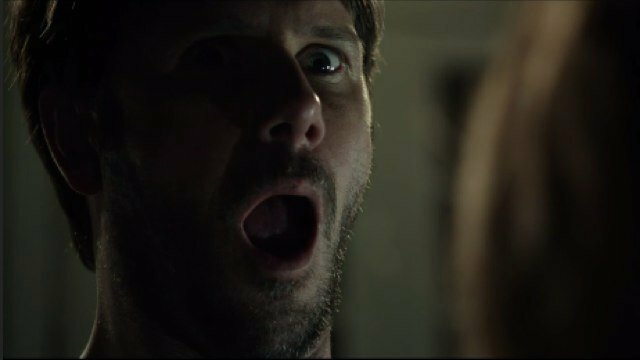 Dark Skies follows the Barrett family as they experience creepy incidents night after night that hint at something sinister lurking around the corner for them. Mother Lacy (Keri Russell) witnesses the events firsthand and is the first to discover the probable cause – aliens with nasty intentions for the family. Her husband, Daniel (Josh Hamilton), is the stereotypical skeptic, despite the amount of abuse he goes through at the hands of the invaders. The film follows a very familiar pattern, which is only made more noticeable by the posters that advertise very loudly the fact that a producer from both Paranormal Activity and Insidious was involved with this film. Just like those two, each successive night becomes more and more threatening until some final event brings the whole shebang to a close. Unlike those two, however, the sense of thrills and chills is much more subdued this time around. Despite itself, Dark Skies manages to craft a suspenseful atmosphere, creating a few tense moments that fare better than the rest of the movie. But director Scott Stewart (Legion, Priest) pulls back on the reins too much, playing things unnecessarily safe. In the tradition of PG-13 horror flicks, the whole thing feels neutered, content to stay as far away from the line as it can. Too many scenes build tension and fail to release it with a worthwhile scare. Most of the performances are serviceable, if not noteworthy. Keri Russell is severely underutilized, and only teenaged song Jesse (Dakota Goyo) stands as an interesting character who deserves attention. J.K. Simmons makes a small appearance towards the end as an expert on the aliens, but his subdued demeanor makes it an unmemorable scene. Stewart’s past efforts were full of wooden acting, and his actors don’t seem to be motivated towards any type of positive outcome. Character decisions quickly fall into the usual horror tropes: walking around in the dark, saying “hello?” to silent rooms and always investigating a sound no matter how unsafe it is. As average as Dark Skies is, it fails to present anything unique enough to set it apart from the rest of the genre. In the mood of charity, I will admit to a few good scares being found here and there. The climax, before it putters out with a ridiculous plot twist, is quite enjoyable and full of chills, as are a few of the nightly happenings. A few jumps are forced throughout, but they all feel like business as usual, running through the motions that we’ve all seen so many times before. Horror fans should check it out for the interesting ideas provided, but it’s nothing more than a discount matinee’s worth of entertainment. Genre fans will be happy to know that Dark Skies isn’t the worst of them all, but only the most devoted will give it a second thought, let alone an initial one. It’s an entirely disposable affair, yet too inoffensive to make a splash in the horror community. The sci-fi/horror mix isn’t enough of either to satisfy both groups of fans, but if there is a group that resides in the middle, then welcome to heaven.